MaterialNet-Material inventory managment for manufacturer, factory, distributor handling MRP, raw material logistic and distribution services. Web remote access feature: maintain operation during outbreak since employee can work away from office individually. Risk management solution for your staffs and business. Purchase Vs sales analysis, which is used to find out the cheapest product supplier and generous customer. Inventory report group by Item, Brand name and product description. Leftover reports with different grouping, by article no, item, brand name, description, supplier and specification, FIFO, storage breakdown, storage charges calculation, low level alert and stock checking by location. Export closing stock report for accounting audit at the year end to save manpower and time to re-type by excel. Expiry date alert avoid expires and waste of day limited items. Storage days report reduced the storage day and hence minimize depreciation percent. Reports of all stock-in and stock-out movement grouping by item, customer, brand name, supplier, delivery order, recipient and job order. Which is used to act as an audit checking against supplier deliveries and customer invoice amount or quantity. Qweas is providing links to MaterialNet 4.08 as a courtesy, and makes no representations regarding MaterialNet or any other applications or any information related thereto. Any questions, complaints or claims regarding this application MaterialNet 4.08 must be directed to the appropriate software vendor. 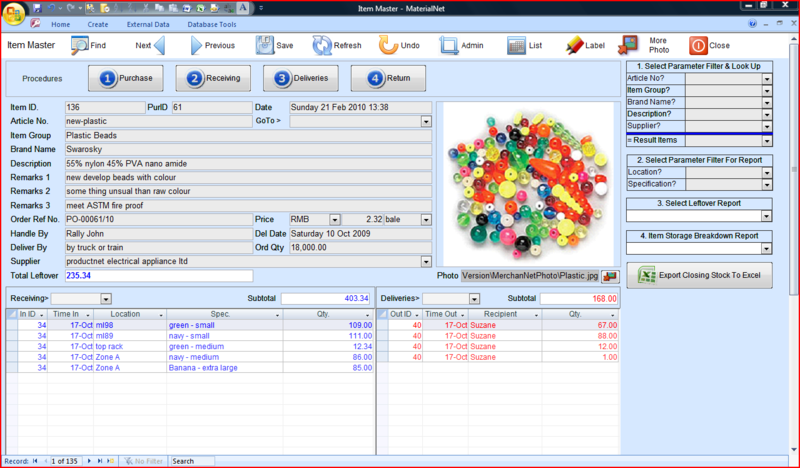 You may click the publisher link of MaterialNet on the top of this page to get more details about the vendor.